SPRINGFIELD — Hundreds of construction workers, city officials, MGM employees, and others gathered at the future site of MGM Springfield Thursday to watch a crane raise the final steel beam into place. 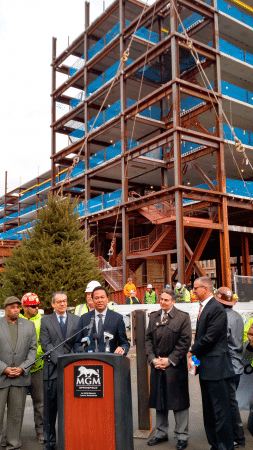 The topping-off ceremony was preceded by short speeches by MGM Springfield President Mike Mathis, Springfield Mayor Domenic Sarno, Massachusetts Gaming Commissioner Enrique Zuniga, Tishman Construction Vice President Randy Pitts, and Iron Workers Local 7 Business Manager Fiore Grasetti. The $950 million casino is scheduled to open in Springfield’s South End in 2018, and Sarno in particular characterized it as the centerpiece of the neighborhood’s recovery from the 2011 tornado. 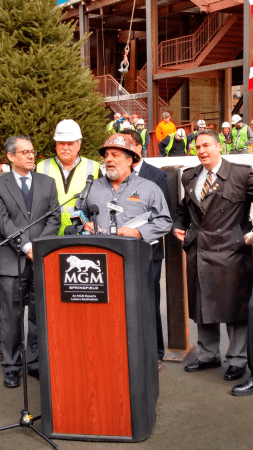 MGM Springfield President Mike Mathis speaks at the ceremony alongside Springfield Mayor Domenic Sarno, who characterized MGM as a “phoenix” rising from the wreckage of the 2011 tornado. Iron Workers Local 7 Business Manager Fiore Grasetti addresses the crowd at the ceremony. 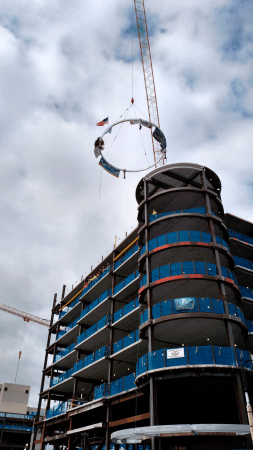 The final circular beam is raised into the sky. 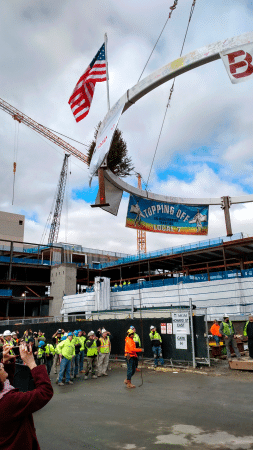 A crane maneuvers the final beam into place atop the future home of MGM Springfield.